Lifetime Guarantee, and my Personal 100% Satisfaction Guarantee. **No fine print, You didn't even have to buy it from me! I have used a recoil buffer for years, and I can say this is one upgrade you should not be without. Tuffer Buffer brand Recoil Buffers are made in Canada, and were designed specifically for the Ruger 10/22 and 10/22 Magnum. Tuffer Buffer replaces the Bolt Stop Pin (B46 on Ruger schematic) When the gun is fired, the bolt moves rearward and contacts the bolt stop pin. By replacing the factory steel stop pin with a Polyurethane Tuffer Buffer, the bolt stop impact is significantly reduced resulting in less noise but more importantly far less strain on the receiver and bolt due to metal to metal contact. 10/22 Recoil Buffer Installation Instructions. Safety First! Make Sure Gun is Unloaded! 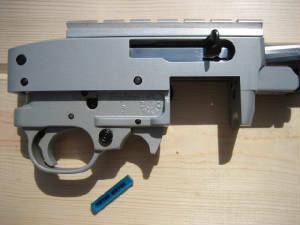 Remove magazine, open bolt and make certain there is not a cartridge in the chamber. Allow the bolt to close. Familiarize yourself with the disassembly instructions and parts list in your Ruger Owner Manual. Position the safety so an equal amount of the button is exposed on each side. 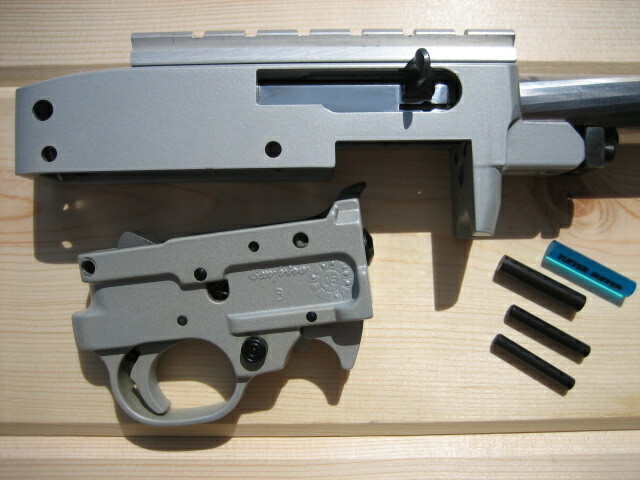 If the safety is not in the middle when the barrel-receiver assembly is lifted out of the stock, the stock will be damaged. Swing the barrel-receiver assembly upward away from the forearm of the stock. Be careful the two Receiver Cross Pins (B-5) and Bolt Stop Pin (B-46) do not fall out. Set the trigger assembly aside, and remove the Bolt Stop Pin (B-46) with a drift. Figure 2 shows the Receiver Cross Pins (B-5) and Bolt Stop Pin (B-46) removed. 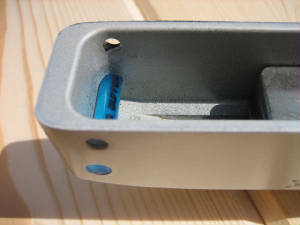 Figure Three shows the Tuffer Buffer installed. A drop of oil and a twisting motion helps to install the new buffer. 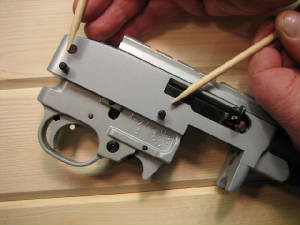 Install the Trigger Assembly into the Receiver, and reassemble the gun.